A 14-year-old Nigerian schoolboy, Nonso Muojeke, whose classmates mounted a campaign against his deportation, has been granted leave to remain in Ireland along with his mother and brother, RTE reports. 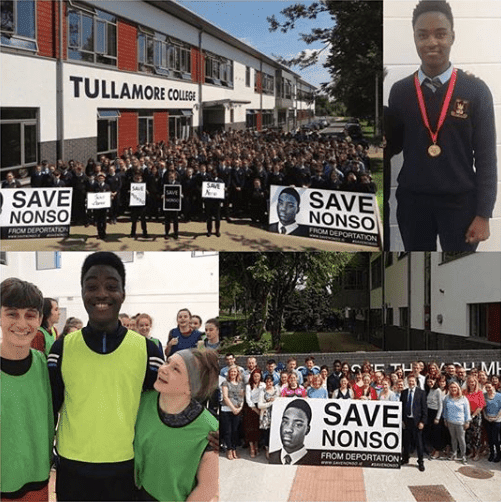 Students and teachers at Nonso’s school, Tullamore College, had protested outside Leinster House, and presented a petition to Minister for Justice Charlie Flanagan in an attempt to stop the deportation order, which was issued last June. Minister Flanagan has confirmed that the family has been granted leave to remain. Nonso was two-years-old when he arrived in Ireland from Nigeria, with his mother and his older brother, after his father died in 2006. The family applied for asylum, but their application was turned down and a deportation order was issued. Nonso’s supporters argued that the deportation would be unjust since he had spent almost his entire life in Ireland. The petition to stop his deportation was signed by 22,000 people. Speaking through an intermediary the Muojeke family said it was “overwhelmed by the news” and appealed for privacy at this time.